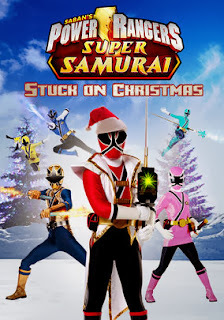 There are other Power Rangers Christmas episodes, but this is the one that Erin found on Netflix. It’s a humdinger. I knew something was drastically wrong after the Rangers defeated a monster in the first 5 minutes of the episode. Then their giant robot loses power and it becomes an excuse for a really crummy clip show. You can have no idea how terrible this was. The acting was beyond ridiculous. The ‘comic relief’ was horrible, and the action/drama was hilarious. There is tons of terrible, extraneous Christmas-pun flavored banter. Only it’s not banter when you’re just yelling ‘quips’ (using that term extremely loosely) at a red-and-green monster. Yes, the monster is red-and-green, and has what looks like a giant ear around one shoulder and a mouth on the other. I laughed a lot and very loudly while watching this episode, but it was not at anything that the creators intended to be funny. 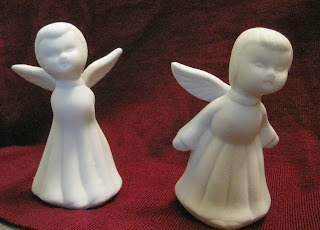 What better way to celebrate Christmas than with a crappy statuette of the Nativity purchased at a dollar store? 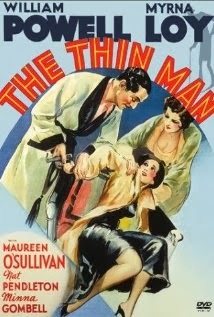 As a fan of Dashiell Hammett I was excited to see The Thin Man on a list of movies set at Christmas. It’s always been one of those eventually-I’ll-get-to-it kind of movies. The movie is lighter in tone than the book, which in turn is already one of Hammett's lighter works. So this is less noir than it is comedy-mystery. The Thin Man focuses on Nick and Nora Charles. He’s a former detective, she’s an heiress, they’re in New York for the holidays to look up old friends and throw lavish parties. One of Nick’s former clients goes missing, then the bodies start piling up, and before you know it everyone from the daughter to the cops are asking for his help looking into the case. Nora thinks it’s terribly exciting, and happily says so. To put it shortly: I loved this. Unlike the first two installments of The Santa Clause, part three is consistent. I'm referring, of course, to the fact the others each had a solid 15 minutes that weren't entirely horrible. You may be tempted to dismiss this as a flaw, but I encourage you to look at it as a boon. At no point does this movie give you hope and wrench it away. 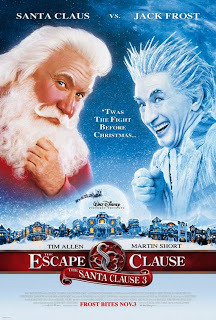 Besides sucking consistently, I'll say one other positive thing about The Santa Clause 3: it doesn't abandon the character of Mrs. Clause from part 2. She's still here and she's still a major part of the plot. It's a common trope to introduce a love interest then relegate her to a cameo in the next installment, so... kudos to the no-talent hacks who made this for not falling victim to that particular awful cliche. I'm pretty sure they checked off all the others. We had never seen an episode of Grimm before this. From this viewing, it’s… okay. I mean, it’s a quirky procedural, spin the dial and land on a quirky procedural these days. A show like this depends on viewers getting invested in its particular set of actors/characters and its particular gimmick. Without that investment, it’s just a mediocre mash up of tropes from X-Files and Buffy about a guy pretending to be a cop in between monster hunting. The monster of this week is Krampus, which we were excited to see. While the visual design is very nice, the plot is sort of blah. The episode opens with a couple of punk kids stealing presents, then Krampus sneaks up on them under a bridge. He snags one, but the other is just injured and hides in a car. Cut to the next morning, when the cops are investigating a dead kid. Only the kid isn’t dead. He’s really, obviously, not dead. This is the point where we started to really doubt the professionalism of the emergency responders on this show. 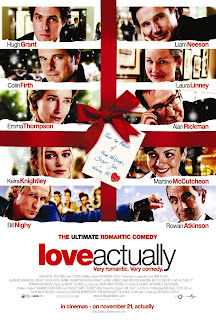 Love Actually is to romantic comedies what absinthe is to spirits. It represents the essence of a genre distilled to a point where it no longer tastes likes a romantic comedy, but even in small doses will still mess with your head. For better and for worse, Love Actually does not come packaged in small doses. This clocks in at around two hours and fifteen minutes. While I did enjoy the movie on this viewing, I would have thanked its editor for amputating forty-five minutes of that. I say "this viewing," because this is the second time I saw the film. I didn't care for it much after the first, though I slid it into that rare category of movies I didn't like but thought were quite good. I was actually someone distressed to find myself enjoying it this time, as I like having a handful of movies fitting that description I can whip out in conversation.